Whether you are facing serious criminal charges or you are suffering from serious injuries caused by someone else's negligence, one thing is certain: You need serious legal representation. 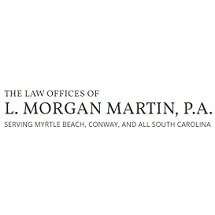 Located in Conway, South Carolina, The Law Offices of L. Morgan Martin P.A. represents clients who have everything at stake and need positive results. Our attorneys will assert your rights and help you find a resolution that protects your best interests. A proven litigator, founding attorney L. Morgan Martin has built a lengthy reputation throughout South Carolina for his ability to get positive results for his clients. His work has been featured in numerous books and television shows. Joining Morgan is Mary Ashley Martin, who also has extensive trial experience. Whether your needs are related to personal injury or criminal defense, you cannot handle these issues alone. By working with lawyers known as some of the toughest, best litigators in the region, you can be sure that prosecutors, insurance companies and judges will treat you with the respect that you deserve. To learn more, schedule a free consultation at The Law Offices of L. Morgan Martin P.A. in Conway today.